Installing solar panels in Shanghai. Photo by Jiri Rezac/The Climate Group. Governments worldwide have adopted greenhouse gas targets to address climate change—most recently, as part of the landmark Paris Agreement on climate change . The G20 countries’ targets are particularly important, as they’re responsible for producing 80 percent of the world’s greenhouse gas emissions. In their recent targets, known as “intended nationally determined contributions,” or INDCs , each country chose different levels of emissions reductions for 2025 or 2030 and presented them in a variety of ways—some relative to historical emissions, some relative to emissions intensity of the economy, and some relative to projected business-as-usual scenarios. 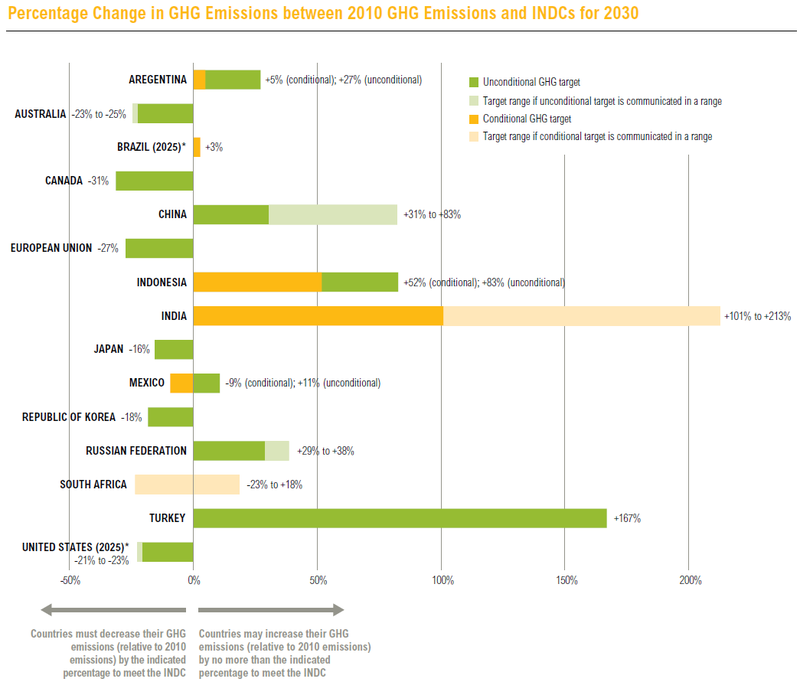 Countries also previously set a diversity of emissions-reduction targets for 2020. In most cases, countries didn’t state what their targets imply for future emissions in absolute terms, so it can be difficult to understand where their emissions are headed assuming they achieve their targets. 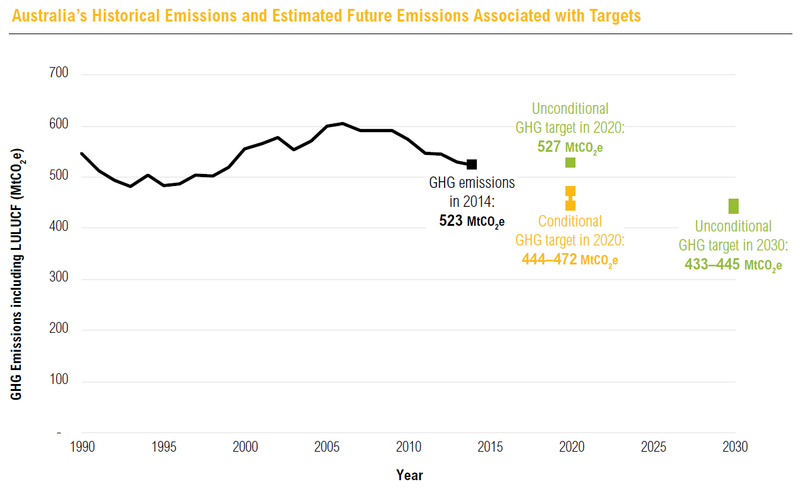 A new WRI paper, Translating Targets Into Numbers , takes a close look at the greenhouse gas targets of G20 countries, including China, the United States, India, the European Union and Brazil, to name a few. The paper translates all their targets into absolute emissions levels to help people understand countries’ proposed limits to their future emissions. The figures below show how countries’ emissions will change between 2010 and 2030 (or 2025 in the case of Brazil and the United States), if they meet their INDCs without over- or underachieving the target. Based on the scale of emissions reductions countries have set, some will need to make additional cuts in their emissions to reach their targets. That’s the case for Australia, Canada, the European Union, Japan, the Republic of Korea and the United States. For other countries, their targets allow them to still increase emissions between 2010 and 2030 as their economies expand—for example, in Brazil, China, India, Indonesia and Turkey. Some countries’ targets are conditional—for example, on receiving international financial support to implement mitigation actions—while others countries’ targets are unconditional, meaning they intend to achieve the targets without any further international conditions. 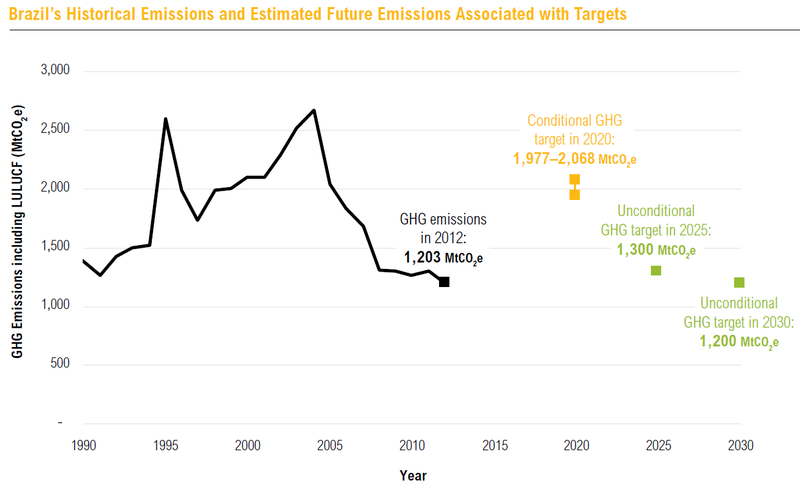 Countries’ targets can also be presented in relation to their historical emissions to show how much their emissions must decline or how much their emissions can increase if they are to reach their targets. In the case of Brazil—just one of the many examples in the paper—the country could increase its emissions and still meet its conditional pledge in 2020, but will need to keep its emissions relatively stable around 2012 levels to meet its 2025 and 2030 targets. Brazil contributed 2.5 percent of global emissions in 2012. In the case of Australia, emissions will need to stay relatively stable between 2014 and 2020 for the country to meet its unconditional pledge in 2020. However, emissions will need to decrease by an average of 1.6 to 2.5 percent per year (relative to 2014 levels) if the country is to meet its conditional pledge for 2020. To meet its 2030 target, Australia’s emissions need to decrease by an average of around 1 percent per year relative to 2014 levels. Australia contributed 1.4 percent of global emissions in 2012 and has the eighth-highest per capita emissions in the world. While the paper analyzes what G20 countries’ targets mean for their absolute emissions, it does not assess targets’ ambition, fairness or appropriateness, or forecast expected progress toward meeting them. Rather, it aims to promote greater clarity and transparency by translating G20 countries’ varied targets into a common metric and presenting them visually to better make sense of countries’ proposed emissions limits. Even with these targets in place, we know that there is still a significant global gap  between where emissions are and where they need to be if we are to avoid the worst impacts  of climate change. With the Paris Agreement behind us and 2020 approaching, it’s important for countries to take stock of where their national emissions are in relation to their goals, ramp up progress to meet their targets, and then set a new round of more ambitious targets for the future.